Our house was built in 1902. Its architectural style is Queen Anne transitional and it has many lovely features that one doesn’t often see in modern homes. One of the comments that we frequently hear around the B & B is “Boy with an old house like this, you sure must have a lot of work to do.” We do have quite a list of work that we’ve done, or had done, to the house in the years that we have owned it. But the list isn’t long just because the house is old. A number of the repairs are ones that a anything except a brand new house could potentially require. (See my post “Basements and Butterflies.”) All houses require maintenance and ours happens to be a big house with interesting architectural details which we would like to preserve. So in a way, I guess, that does come back around to the age of the house. 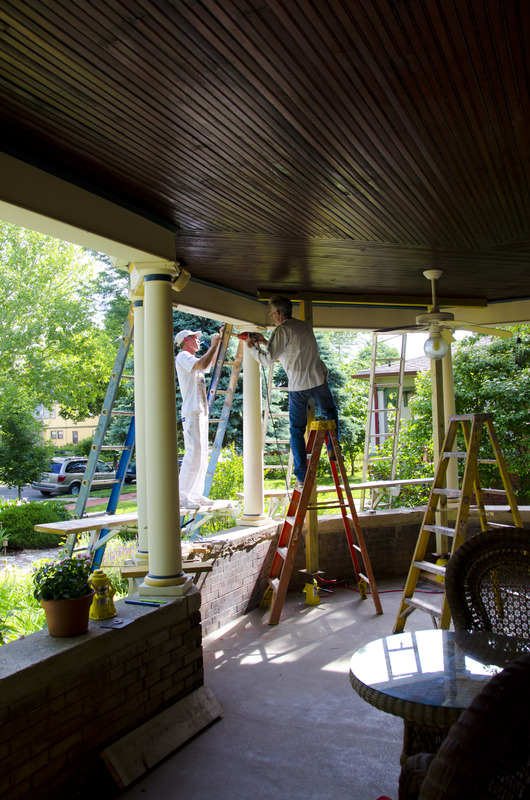 Our contractor, Russ, employs a euphemism which we dread hearing … “deferred maintenance.” That is when a home owner doesn’t stay on top of repairs and something that could have been a smaller job turns into a bigger and hence more expensive one. So when my husband recently discovered water coming through the porch roof between two of the columns, I got on the phone to Russ. 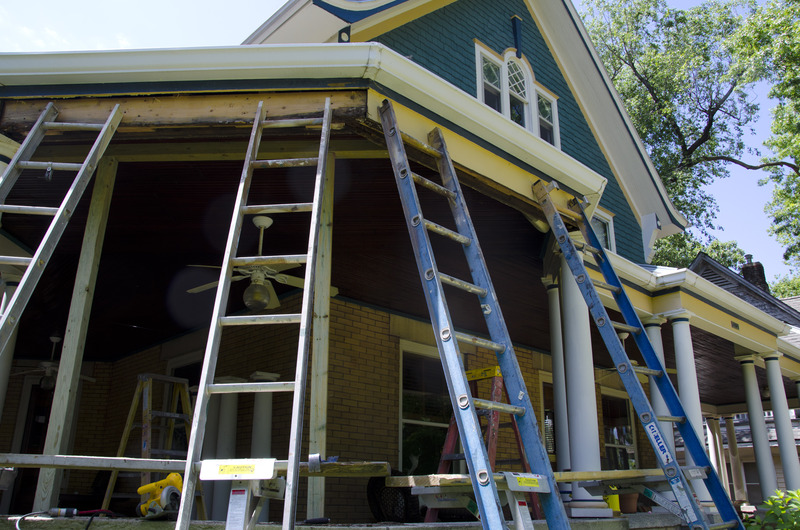 Russ sent brother Tim over who told me that they were going to have to prop up the porch roof and pull several columns so that they could remove and replace the damaged boards. I didn’t like the image that conjured up. I had visions of broken columns and layers of rotten wood. The wrap around porch with its columns and its varnished wood ceiling is one of our favorite features of our house and I didn’t want anything bad happening to it. Russ and Tim and the guys have always done good work for us, though, so I did my best to put my worries aside. We chose a sunny day when there weren’t any guests around the house as the best time to have the work done. Once the guys to started, they had the roof secured and the columns pulled out in almost no time. And violà the house was still standing. Thanks to Bill’s observant eyes, and to our trusty contractor, we caught the damage before it had gone very far; and everything has been fixed. They were able to do all of the repairs yesterday and today painting is all that needs to be done. The culprit in all of this — improper gutter installation. The gutters didn’t have the appropriate backing where they wrapped around some of the porch’s corners. They looked fine from the front. We just had no idea what was behind them. So you can guess what is next on our list. But if you own an old home like ours, you’ve got to love it and that means giving it some t.l.c. 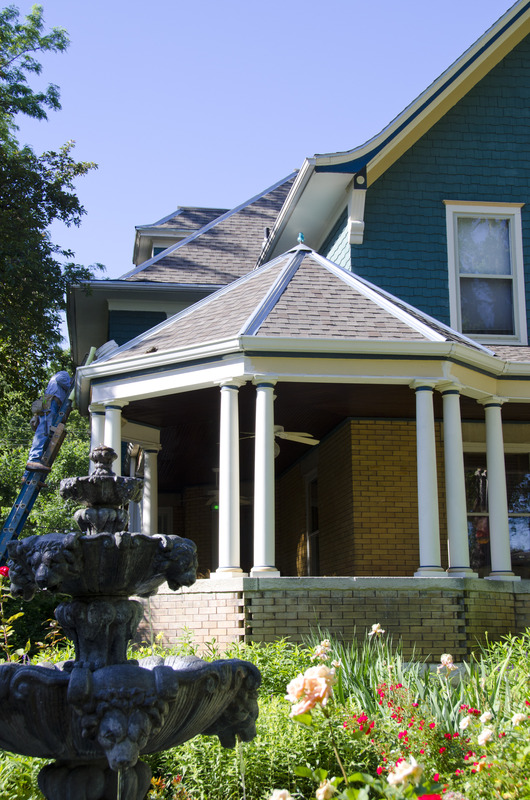 This entry was posted in House Stories and tagged Bed & Breakfasts, Historic Architecture, Kansas, old homes, Photography, porches. Bookmark the permalink.